Product information "Panasonic RF-D100BTEBT DAB Radio with Bluetooth"
To achieve its elegant design, Panasonic places high priority on the use of only original materials, including aluminium on the front panel and a wooden box encasement. The modern and simple horizontal shape is complemented by a large, easily visible Dot Matrix LCD and Twin Rotating Knobs, which provide effortless operation and a highly attractive appearance. Two advanced 2.5 inch full-range speakers within a sound-enhancing, high rigidity wooden box deliver powerful and rich sound with harmonic overtones. In addition, a special insulator and bass reflex port achieve dynamic bass. The RF-D100BT is also equipped with an Equalizer function that can be set to Heavy, Soft, Clear, or Vocal mode to change the sound effects to match the user's music type and preferences. 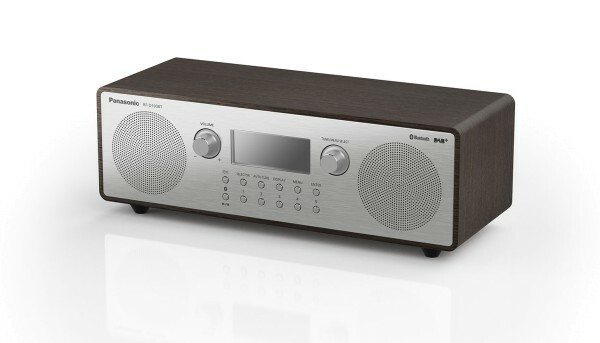 DAB/DAB+ compatibility allows the RF-D100BT to access more stations, whilst Bluetooth connectivity lets the user transmit music from various devices such as a smartphone and tablet. Users can also connect with AUX to access an even wider variety of music sources to benefit from the high-quality sound. Related links to "Panasonic RF-D100BTEBT DAB Radio with Bluetooth"
Customer evaluation for "Panasonic RF-D100BTEBT DAB Radio with Bluetooth"